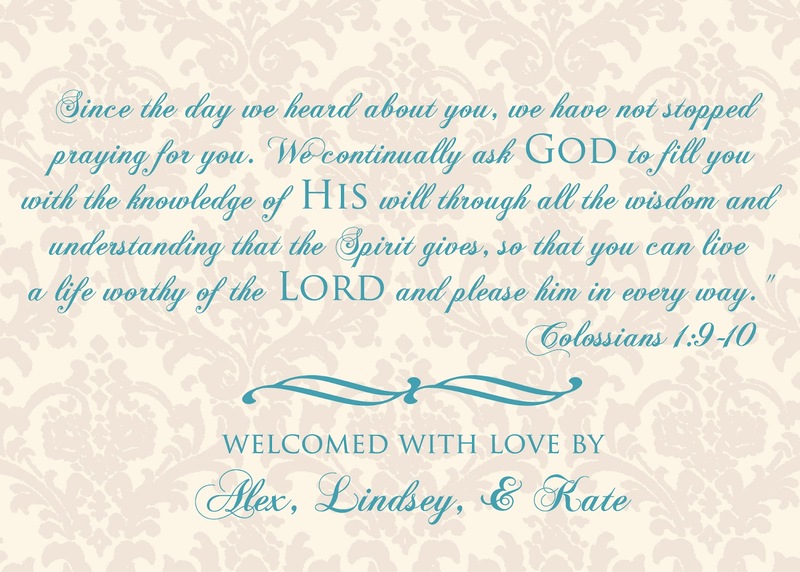 Blessings, Miracles, &Thoughts in Between: Birth Announcement! I have been planning Will's announcement for months! In December, I got a beautiful announcement in the mail from the sweet SheShe! I knew immediately that I wanted Sarah to design Will's announcements as well! Thankfully Sarah was able to squeeze me into her busy schedule since she isn't doing design work right now as she anticipates the arrival of her baby girl! We had Will's newborn pictures taken when he was 12 days old and I let Melissa, our photographer, know what kind of image I wanted for the announcement. She agreed to send me the announcement file that week so I could get them out - I am in love with the picture and cannot wait to see the rest of Will's newborn pictures! I told Sarah I wanted simple yet formal and that I wanted a specific verse on the back. This verse is on the back of the canvases in Will's room (thank you Kimsey) and it is the perfect verse to claim for Will! I had the announcements printed on linen paper and they are so beautiful in person! These digital files just don't do it justice! You'll notice the spelling change of his middle name. Long story short, Emitt is a family name on both sides (my paternal grandfather and Alex's paternal grandfather). As we were filling out the official birth certificate papers we decided to use the Boggan spelling (verses my family's spelling that we were originally going to use). Will is the last boy to carry on our line of the Boggan name (Alex and his dad are both only children) so it seemed fitting to use his great-grandfather's spelling to carry on tradition! Thank you Sarah for such a beautiful announcement! 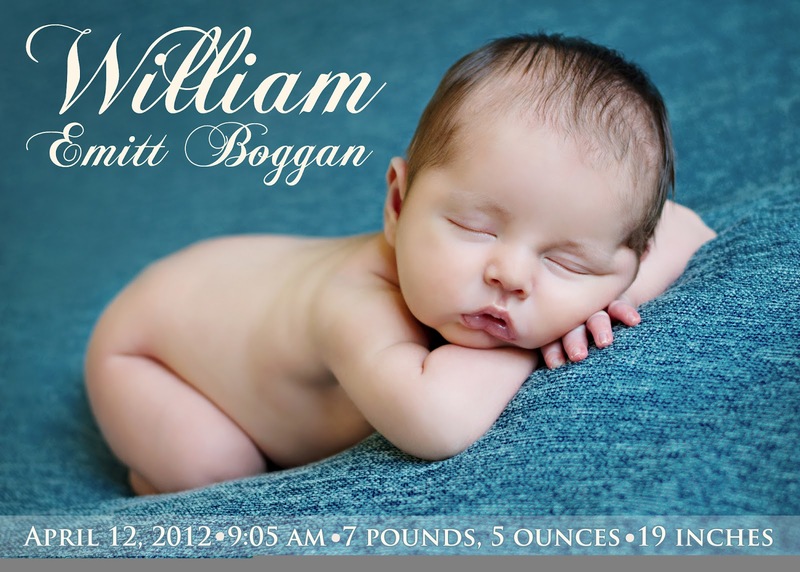 It was the perfect way to officially introduce Will to our family and friends! Its gorgeous and I love that verse on the back!! Wonderful picture. 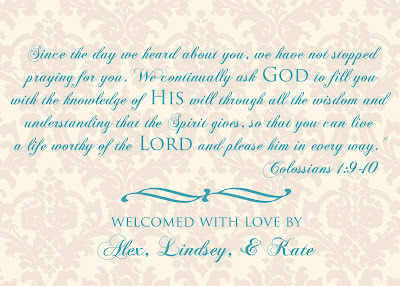 It is absolutely perfect, Linds! I love every part of it. Gorgeous...Just like your little man!! But I forgot to take pictures of the back... I love that verse though! Oh my goodness these are beautiful!! Beautiful picture of your baby. How do you know that god is male? these turned out perfect! sarah did a great job!